I often find that I fish out the veggies in sour curry and leave a lot of broth at the end. I recommend have more watermelon rind ready when you find yourself with just leftover broth. 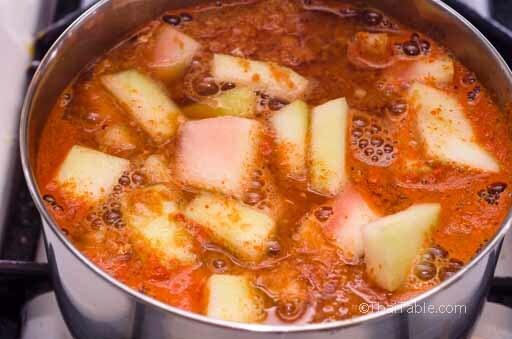 Add the watermelon rind to stretch the curry. You can use more or less fish than what's called for. I sometimes use leftover fish from another dish. Any white flesh fish works for this dish. In Thailand, a snakehead murrel(ปลาช่อน) is the fish commonly used in sour curry. Adding sugar is optional. If you do, add just enough to round out the sharp flavor but not enough to taste the sweetness. You can always add more water if you feel that the flavor is stronger than what you like. Slice the hard green skin off the watermelon rind. 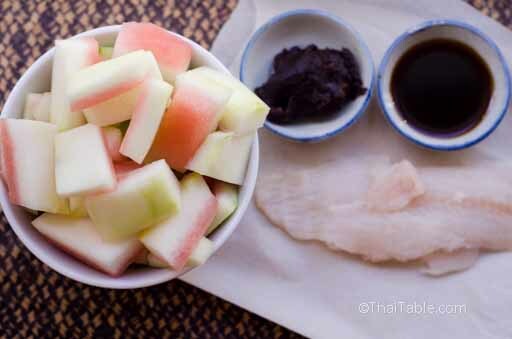 Cut the watermelon rind into bite size pieces, ¾ of inch by 1 inch. 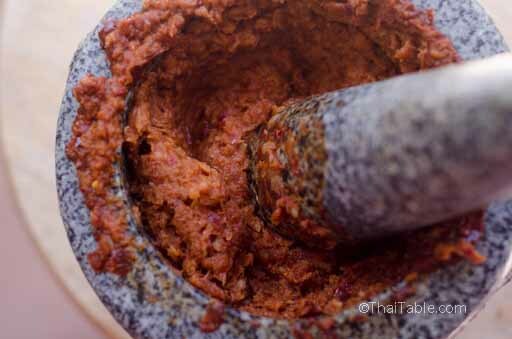 Sour curry paste is so simple that most people don't buy it but make it right before they make the curry. 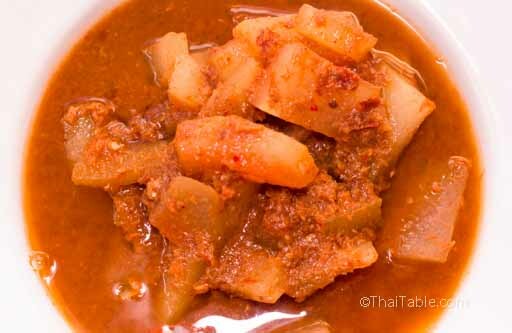 The core ingredients in sour curry are dried chili peppers, shallots and shrimp paste. See our Homemade Sour Curry Paste. 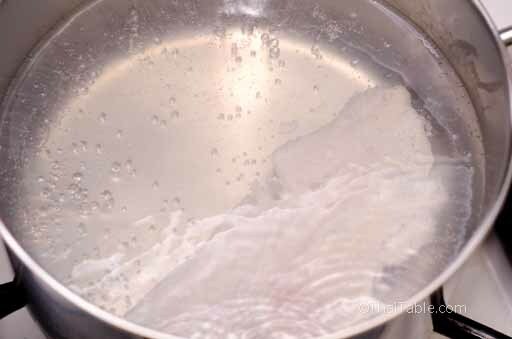 Boil the water in a pot big enough for 8 cups. When the water boils, drop the fish in. Let the fish cook for a minute or 2 until it turns white. No need to wait until the water boils again. We just need to cook the fish. Scoop out the fish and drop it in the mortar. Do not discard the water. Keep the water simmer while you pound the fish. 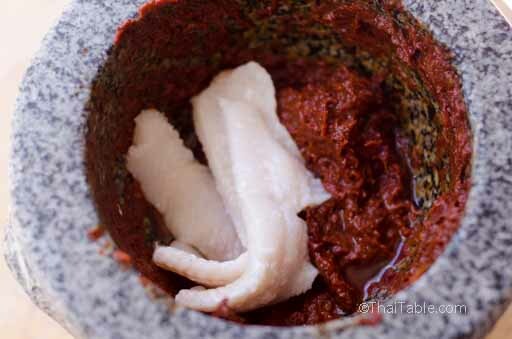 Pound the fish with sour curry paste. As you pound the fish, you may see bones, pick them out. When the fish is finely ground, scoop out the mixture into the pot. Let it dissolve in the boiling water. The broth should turn bright orange instantly. The ground fish should disappear and thicken the broth. Drop the watermelon rind into the pot. Let it boil. Add tamarind and fish sauce. Stir and make sure that the tamarind is completely dissolved. 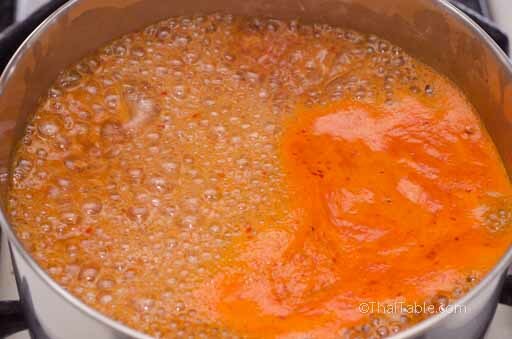 You can add the tamarind paste into a ladle with a little bit of hot broth for a quick dissolve. Taste the broth. The broth should taste very strong, sharp sour and a bit salty. This strong flavor will disappear into the mild watermelon rind. If you decide to add sugar, add a scant ½ teaspoon to round out the sharpness of the tamarind. I don't add sugar to mine since I love it sour. If I cook for my mother, I have to add a tiny bit of sugar because she likes it that way. Most of the Thai restaurants would, too. And often, so much sugar is added that it ruins the dish for me. 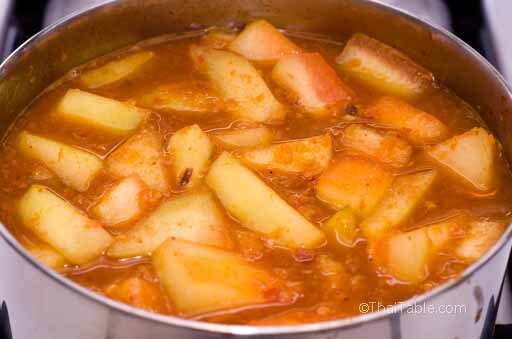 Let the sour curry simmer for 10-15 minutes or until the rind is no longer crunchy. The rind should be soft but not mushy. It should turn translucent when cooked. The light green now looks a little orange from absorbing the broth. The bottom of the pot should appear pulpy from the ground fish and spices. Before serving, stir up the fish and spices on the bottom of the pot. Ladle into a large bowl or a hot pot.